One of my favourite types of gifts to receive are definitely homeware items, as much as a new perfume or pampering beauty set will always go down well I find myself getting just as excited about new stuff for my home. 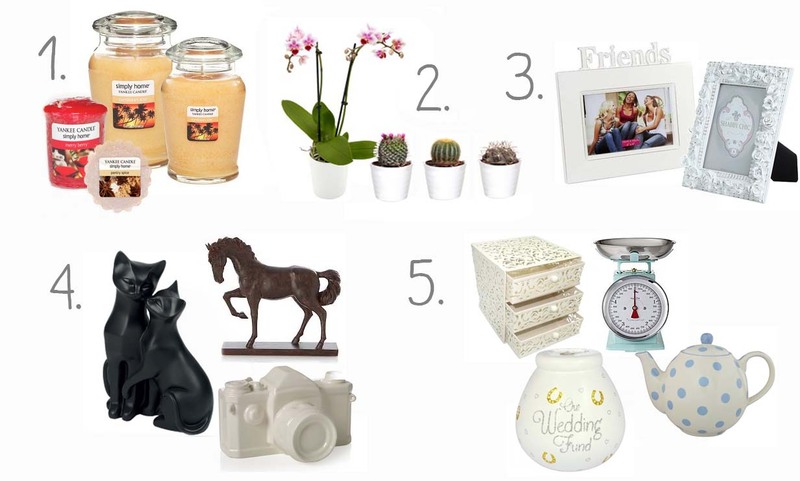 If you're buying for someone who's recently moved house or is just into cute homewares in general then there are some amazing pieces out there- most of these are things that can easily be found in supermarkets and local shops (which is great if you've left it too late to order anything!) So if you fancy giving something a bit different year, here's what I think would work well. Yankee candles are a pretty safe gift in my opinion, most people know the brand and are probably going to like them. You can find their 'Simply Home' range in the homewares aisle in most supermarkets, even the largest jar candles from this range are only £13 so not too expensive at all. You could even mix and match a few different scents with the smaller candles, wax tarts and sampler candles and put together a custom hamper. I think this is a really nice alternative to giving someone flowers as it's something that will last and will brighten up their home all year round. Because you're going to be giving it as a gift you're going to want to pick a nice one- I like Ikea's mini cactus (they come in a set of three and you can choose between white or pink pots) you can usually spot gorgeous potted orchids in Asda or Tesco too for under £10. This is a great sentimental gift, a pretty photo frame with a picture that will mean something to the person you're giving it to. It's inexpensive yet heartfelt, especially great for parents, grandparents or friends you don't see often. If you're after something a bit different then you can have photos printed on just about anything- cushions, mugs, calendars etc. Just make sure you're checking dates to make sure your order can be printed in time for Christmas. Obviously you're going to want to choose something that relates in some way to the person you're buying for rather than a generic ornament, but if you can find something suitable this could be the perfect gift. If they're a dog/ cat/ animal lover it will make it easier as there are loads of little animal shaped ornaments, but if you know they have a particular interest then search for things based on that. I really like the camera ornament above from Wilkos, I'm probably going to buy this for myself in the new year! Again this is completely based on what their interests are. For example, a huge mug or a teapot for a tea lover, a decorative box for a jewellery lover, a money box for someone you know is saving for something important like a wedding or a cute cooking accessory for someone that loves to bake. If you want to give completely alternative gifts this year, why not consider a piece of furniture? It might not be typically something you can wrap and pop under the Christmas tree, but I got my dressing table as a gift and it's one of my favourite things I've ever received. So if you know that someone is lusting over a new piece of furniture then why not make their day? What are your favourite kinds of gifts to receive? Aww those cuddling cats are so cute! I like to give scented candles and hand creams (together). :o) They just seem like safe yet thoughtful gifts. This year, most people I know are getting a Bath & Body Works "Lavender Vanilla" 3-wick candle, and Caswell-Massey "Almond & Aloe" hand cream. I can never resist a yankee candle!